An arts organization on the far South Side of Chicago is in the process of recruiting artists to help raise awareness for an organization that helps kids throughout the state but is currently in limbo because of budget impasse in Springfield. Recently, the Illinois Collaboration on Youth (ICOY), a membership association that acts as a voice for children and young people facing issues such as homelessness, mental illness, physical abuse, drug and criminal problems reached out to The Alliance, formerly known as The Beverly Area Arts Alliance to get the attention of legislators. The ICOY has reserved the rotunda in the Illinois State Capitol March 2 from 7 a.m. to 11 a.m. The area is frequented by legislators and their staffs going to and from their offices and is often reserved by groups trying to get noticed. ICOY CEO Andrea Durbin said she came up with the idea to reach out to The Alliance because she wanted help making a statement. On February 3, Durbin and ICOY Policy Director Nora Collins-Mandeville spoke to 10 artists who showed up for an Alliance meeting at Kunsthaus Chicago, 10552 S. Western Avenue. Durbin explained that because of the current budget impasse in Springfield, her group, along with most groups who rely on state funding, are in danger if legislators do not act soon. Her goal is that legislators and their staff to take notice and interact in an effort to keep her group funded in the state budget. Durbin said her group, which relies on state funds for 90 percent of its $4 million budget, needs lawmakers from both sides of the aisle to come together. Durbin added that while she’s been asked about possibly bringing a few of the 40,000 kids served by groups that are members of the ICOY association, she does not want any of them to get hurt by political inaction. “If a child goes to Springfield and talks about the worst day, or worst incident in his life and gets nothing in return, they get exploited again,” Durbin said. Instead, she is sharing testimonial letters with artists to give them inspiration to come up with artwork to give voice to the ICOY’s cause. Campbell explained that her goal is to have 4,000 strips of fabric measuring 18 x 2 to 3 inches, each hung on a display that she is creating. 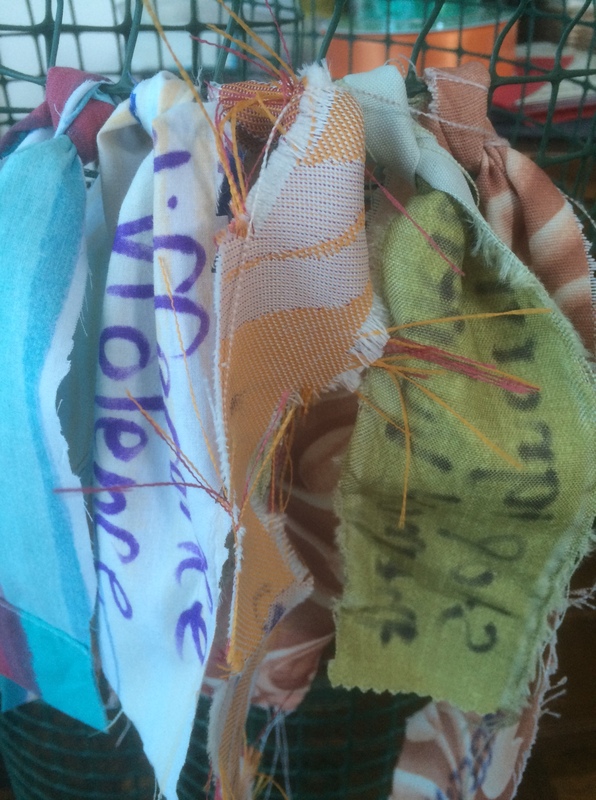 Each strip of fabric will represent 10 young people helped by the ICOY. The display, which must be transported to Springfield, will largely be created with mesh screen-like material similar to chicken wire, Campbell said. She estimates that they will need approximately 45 yards of fabric, some of which has already been donated by local store The Quilter’s Trunk, 10352 S. Western Avenue. A few of the 4,000 strips of fabric Sal Campbell and other artists plan make a statement to Illinois state legislators with. For artists who want to submit work, the deadline is February 26. In addition, Campbell said The Alliance has created hashtags for people to use to spread the word via social media. The tags are #ILBudgetNow and #OurStateOurResponsibility. After the meeting, several of the artists said they were inspired by Durbin’s presentation and planned to contribute. Beverly visual artist Suzanne Sebold said she is planning on incorporating the words from the children’s letters into her piece. “I’d love to incorporate their words into my piece, which most likely will be a painting that fuses taping and collaging,” Sebold said. Midlothian photographer Charleen Thomas said she didn’t know what to expect before the meeting but left with several ideas racing through her mind. “Before the meeting I was sketchy on the details but it was really helpful and inspiring. I feel like I cannot not do something,” Thomas said. Beverly artist David Barsotti said he planned to help with the tapestry collaboration and may come up with his own piece as well. He added that he was discouraged about what he described as inaction by Illinois’ lawmakers. “I’m not a politician or an economist, but it seems like these politicians are using this budget impasse as a quick fix and are not concerned about the future,” Barsotti said. Durbin said that while she hopes more artists get on board with the project before the March 2 event, she urged other concerned citizens from all over Illinois to reach out to their legislators.